Hallmark are proud to announce a brand new arrival in their family of Interactive “Story Buddy” soft toys. Abigail, a pretty brown bunny will be the first lovable lady to join the cuddly clan, which currently includes Watson the Racoon, Cooper the Bear and Jingle the Husky Dog. The perfect gift for your little bunnies this spring, Abigail is a real girls’ girl. She loves tea parties and playing dress up and through her adventures learns the vital life lesson that being herself is the absolute best she can be. 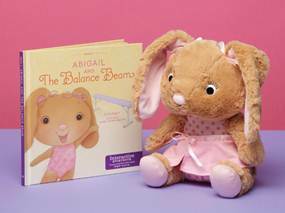 Abigail comes complete with her own story book, ‘Abigail and the Balance Beam’ which follows the chatty bunny trying to make her mum extra proud of her by performing gymnastics. As passages from the book are read aloud, Abigail springs to life and joins in the story! Additional books featuring the exciting adventures of Abigail are also available including, ‘Abigail and the Tea Party’; a tale of a special tea party hosted by Abigail’s mummy and ‘Abigail and the Lost Purse’ which follows the discovery of some dress up clothes that later turns into a fun girlie game. Children will love listening to the adorable floppy-eared bunny join in with the new exciting narratives as, page by page, a new phrase is unlocked for Abigail to say. This interaction, as well as the delightful toy itself, makes the reading experience a magical one for the whole family to share! For even more story time fun with Abigail, there is also a downloadable app suitable for use on iPhones and iPads, to accompany the playful bunny. The free app includes a short animated story that can be played aloud through the app’s internal narrator or recorded by a loved one to add a personal touch to the tale. The app also includes child-friendly puzzles and an interactive game that lets your child play dress-up with Abigail, just like in the book! Priced at £19.99 Abigail is available from April 2012 in Hallmark stores and atwww.Hallmark.co.uk. The additional books for Abigail are also available from the same outlets priced at £5.99 each. Further cuddly characters are set to join Abigail and the rest of the Story Buddy crew later in 2012. Comment on this post leaving your name and email (or twitter handle). Use the buttons below to tweet, like, share, google+ etc. Most importantly, don't forget to say in your comment which ones you have done, and PLEASE leave your email address (or twitter handle) too so I can contact you if you win. This competition ends on Sunday 1st July 2012. UK entrants only. Thanks for all the entries so far! Don't forget to click on the "join this blog" button on the right hand side! Aww so cute! Please enter me to win! Hiya! I've followed on twitter, liked you on facebook, & joined via google connect! Use the buttons below to tweet, like, share, google+ etc - done all of these. i have tweeted, followed on GFC, followed on twitter, followed on facebook and google +1'ed the post. Signed up to your blog. Liked a Pret-a-Mummy on Facebook. This competition is now closed, results to follow. The winner was Emma Cella!